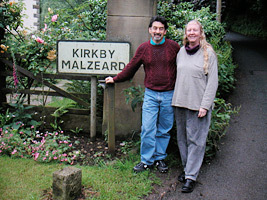 Yes, there is a place called Kirkby Malzeard! About Us: The Pacific Sword Co. was originally formed by local English country dancers to perform a Longsword dance as part of a Mummers Play at the 2008 Santa Barbara Revels. Yet, from the very beginning the aim was to organize a dance team that operated independently, with our own distinct outfit (or “kit”) and a touring schedule that went well beyond the yearly Revels performances. At present we perform two Longsword dances. We do a five-person version of a dance based on a sword dance collected in the Yorkshire Dales village of Kirkby Malzeard, and we have recently begun performing a “recently remembered” Scottish dance for five swordsmen. See us in action on our photos and videos pages.